So you've already read my spiel on pomegranate molasses and how it is a somewhat obscure ingredient here in the US. Well I used only 2 tablespoons of it for the eggplant, and I have an entire bottle. So while I'm on the subject, I thought I'd better give it another go. This time the fiancé had to be appeased with a little meat (I have vegetarian tendencies, but don't classify myself as anything in particular). 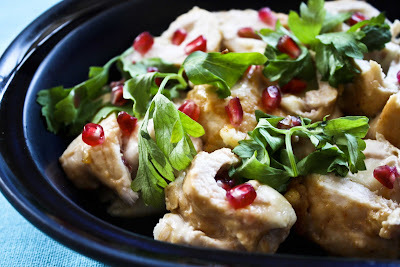 Again to Paula Wolfert, in "The Cooking of the Eastern Mediterranean" where she gives us this Georgian dish in which pounded chicken breasts are stuffed with mozzarella and basted during broiling with that wonderful sweet/sour pomegranate glaze. Worth it. Season the breasts with salt and pepper, place the cheese in the center of each breast, sprinkle with paprika and roll the breast tightly into a cigar shape. Cover each seam with 1/4 of the reserved skin, then secure with cooking string at 1" intervals. Sprinkle olive oil all over each breast, and refrigerate now until :45 before serving. When ready to serve, bring the chicken to room temperature and preheat the broiler. 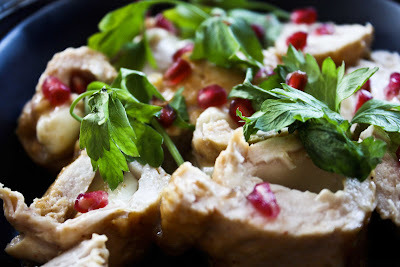 Brush the chicken with the pomegranate molasses and then with the mayonnaise. Broil the chicken and baste often with the pan juices. While Wolfert says the chicken should be done in about 12 minutes, my broiler took about 5 minutes longer than that. Let the rolls rest 5 minutes before uniting them and slicing them to serve. Garnish with sprigs of fresh herbs, pomegranate seeds and the onion rings. Sprinkle with the pan juices. Enjoy this very flavorful dish! There's something definitely comforting about this, I just can't put my finger on it. Maybe it's the funky Pomegranate twist on something so beloved and simple. Or maybe it's that nice blue dish. This looks delightful! I'm a complete pomegranate junkie, so this really appeals to me. Yummi i really should try this! Andrea thank you for leaving a comment.